As Democrats, we should be proud to stand in support of the striking Verizon workers and their unions, the Communication Workers of America (CWA) and the International Brotherhood of Electrical Workers (IBEW). We need to defend American workers and the unions that represent them not only because hardworking people deserve a living wage but also because they deserve a dignity wage. This is not only an economic issue; it is a moral issue. The income gap between rich and poor in the United States has not been this large since the early 1900’s. This income inequality gap inversely corresponds with the decrease in union membership. While the average total compensation of S&P 500 CEOs is $11 million, worker income has stagnated as the cost of living has dramatically increased. Verizon’s CEO, Lowell McAdam, for example, receives an annual cash compensation of $18 million about 500 times what an average worker earns at Verizon. A comparable European or Canadian company CEO to worker pay ratio would be about 20 to 1 prompting one columnist to suggest, perhaps corporate stockholders should be outsourcing CEO jobs. It’s also more than an argument about wages. 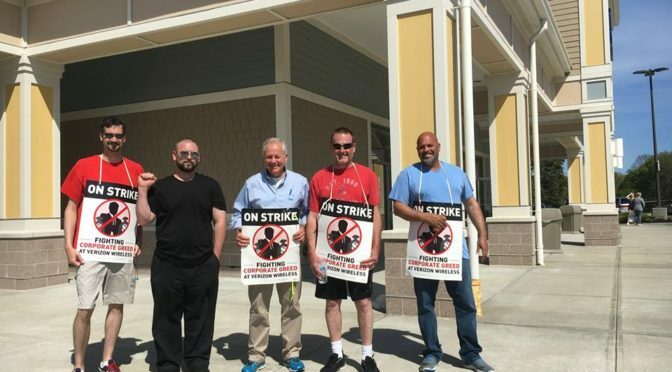 Verizon wants to get out from under the union and has designed their offer to reduce the number of union workers and provide less job security for union workers in exchange for a pay increase. Telling workers they will receive slightly more a year but also be much more in danger of losing their job entirely is the worst sort of corporate bullying, and we shouldn’t stand for it. We must draw the line here. When companies that make outrageous profits while keeping their employees bordering on poverty, we draw the line. When companies can afford to pay a CEO millions of dollars a year but take away the healthcare of striking workers who are asking to be able to meet the basic necessities of life, we draw the line. When honest, hardworking people are backed into a corner and being asked to hand over their job security (arguably the most precious thing to workers), we draw the line thicker and bolder than it has ever been drawn. This is a moral issue. This strike is about the future of American families. Over history, unions have been the chief advocates for working people, not people who want to line their pockets, but people who want to support their families. Unions brought us the weekend and showed us that when we are united—all of us, union or not—we create better lives, better communities and a better world. Without unions, we find ourselves in a never ending race to the bottom. I will stand with these union workers who are standing up for America’s working families and I call on all Democrats to join us. Matthew C. Patrick, Candidate for State Rep, third Barnstable District. Previous PostThrowback Thursday, Peace Corps StyleNext PostOur First Two Endorsements in 2016!